With stocks surging one moment and plunging the next, it's good to remember that, from 1926 through 2016, a portfolio diversified across stocks, bonds and cash averaged a 9.6% annual return, with a better risk-reward ratio than any one of the four investments with large liquid markets. 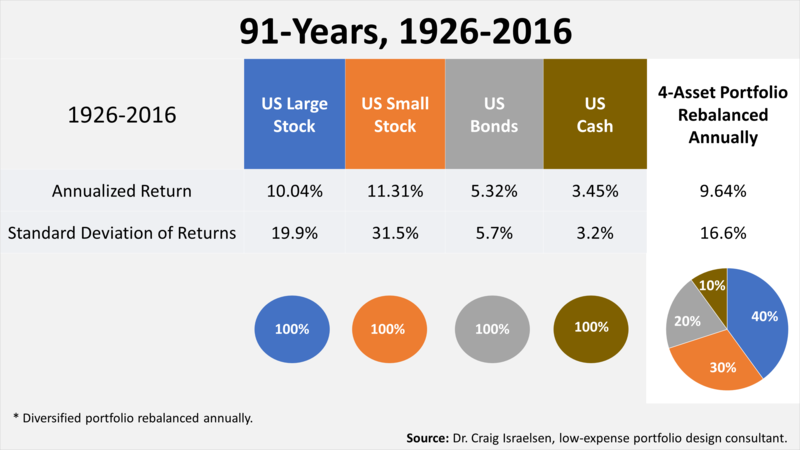 Ninety-one years goes back to when stock returns were first recorded on Wall Street, but most people don't invest for 91 years. The bar chart shows returns of the four investments versus the diversified four-asset portfolio over more realistic holding periods. Over 35 years, large-company stocks beat their long-term average return over 91 years in a whopping 88% of the 35-year rolling periods! In contrast, over all of the 10-year rolling periods between 1926 and 2017, large-company stocks beat their 91-year return in only 46% of the 12-month rolling period. The Leading Economic Index (LEI) for the U.S. increased by four-tenths of 1% in March, following a one-tenth of 1% increase in February, and showing no change in January. © 2019 Prism Capital Management, LLC -2. All Rights Reserved.